If it wasn't a joke before, now it really is, as news reports are claiming that totally ineffective New England Patriots wide receiver Chad Ochocinco will be changing his name back to Chad Johnson. 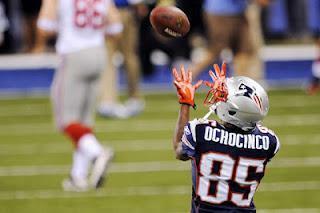 Ochocinco, who was traded by the Bengals to the Patriots this off-season, did absolutely nothing in New England. Given his consistent contributions in Cincinnati, his sudden plummet into irrelevance raised some eyebrows. However, it's unlikely it wouldn't have mattered what his name was this season, and he will likely find himself unemployed next year. Don't worry though, Ochocinco is changing his name back to Johnson for a good reason! The whole thing is almost too good to be true. The biggest kicker for me? The fact that Ochocinco was still employed, let alone on a team that made it to the Super Bowl, and fellow diva wide receiver Terrell Owens didn't get a single call this off-season as a free agent. I know that generally when talking about ridiculous wide receivers, Ochocinco and Owens are usually interchangeable at #1 for the most distracting on a team. But there is a big divide between being a distraction and not doing anything, and then being a pain, but still posting up good numbers. I'm sure that Ochocinco, 34, knows that this season may have been his very last. It's possible that in his typical vain fashion, he wanted to go out by at least cracking headlines one more time. Well, Chad, congrats, you made it onto our site here at Beard and Stache! And, while we are handing out congrats -- Chad, I hope that your marriage with Ms. Basketball Wives works out. For a while, I was actually looking forward to seeing a last name with a hyphen and 'Ochocinco' at the end of it! Be sure to follow Beard and Stache on Twitter @BeardAndStache, and also Troy @TroyBallards, Like our Facebook page HERE! What's Wrong In Laker Land — And Who's To Blame?